Home » Articles » Business Growth » Who Owns Social Media? I had a fantastic conversation with Frank Eliason (@comcastcares), Duncan Riley, and Chris Brogan last night during the Microsoft Windows Mobile Developer event (@WMDev) at Chapel in Seattle. We explored the drivers that propel companies into social labyrinths and how they participate, react and in turn, strategically plan (or should) once they’ve arrived. The common motives are spurred through innovation (rare) and urgency (more common). However, the debate from within will eventually arise, questioning who owns social and how do we organize resources, time, technology, processes, and budget to support it. Truthfully, many departments (not all, not most), will be forced to socialize and therefore require social programs at the departmental level managed by a centralized group (that most likely managers other factions of branding or communications concurrently). In the meantime, it’s utter chaos and social anarchy within…just look at the disjointed efforts of even the best brands engaging online and their discontinuous and fragmented use of social networks that only muddle and dilute branding efforts and existing equity and resonance. Is it PR, Marketing, Advertising, Service? The answer is clear, your customers and influencers own & define it. And, without guidance or participation, they steer the impression and perception of your brand. Social CRM is much more than engagement strategies and tactics however, it requires a completely revamped infrastructure to support effective socialized relationships management through technology and resources. While I may throw everyone a curveball when it comes to my SXSW plans, I do quietly have a panel on the SXSW panel picker with Damien Basile that I think will serve as one of the more intelligent, educational, and rewarding discussions during the event, i.e. getting out of the echo chamber and helping real businesses learn real techniques and processes to streamline and expand. – What is Social CRM and how is it different than CRM or CRM 2.0? – Who owns the conversation? 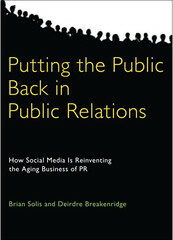 Who is responsible for sCRM if Social Media is cluttering the internal marketing landscape (PR, Marketing, Interactive)? – How is the infrastructure of CRM adapting to incorporate the “now” or real-time web? – What are the new roles required for sCRM? – What are the advantages and disadvantages of offshoring vs. nearshoring? – How does an organization justify the less costly form of inbound-focused customer service to outbound CRM and ORM? – Is there value in engaging everyone on the social web? – How can companies change and adapt internally to reduce the negative chatter, thus reducing required responses? – How should a brand manage a crisis about them in social media? – How much transparency does a brand need to have in social media in respect to government agency regulations? An in-depth discussion of how social media networks & tools like Twitter, Facebook, LinkedIn and blogs are important to brand customer relationship management. Who should be heading up these efforts, what rules they need to abide by and what companies are getting it right/wrong will be looked into. In the social Web, a brand’s perception reputation is in the hands of the new influencers – those customers, peers, and prospects who leverage social media to voice their views, opinions, and questions. It’s how you discover and engage in these discussions that determine the brand’s resonance. This question of “who owns social media” is to me obsolete. It’s like asking who owns email or wireless calls. Different people in different organisations within a corporation will have to immerse themselves ( as a workgroup) in communities and conversations. There are some requirements around consitency, brand image, capitalization of the activity from different people within the same company, training on messaging … but the ultimate ownership is distributed and start , as you point out from the outside in. I believe naming social media as a “media” is misleading. There is no such a thing as social media, there are communities and social ecosystems and from a marketing standpoint, what is really at stake is how companies engage with these different communities wherever they hang out (from Facebook to twitter to blog to real life).